Taro root is similar to potato but denser, sweeter, and creamier. If you can’t find taro you can use potato, but the taro really makes this dish authentically Greek. 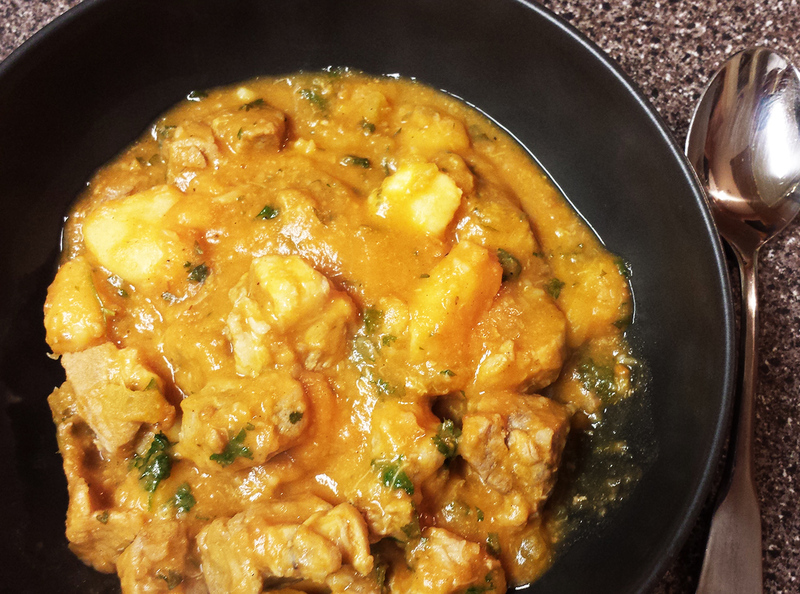 The taro thickens the stew and makes it creamy and wonderful. Heat the oil in a large, heavy saucepan over medium heat. Add the pork cubes and fry until browned, about 5 minutes. Remove with a slotted spoon and set aside on a plate to keep warm. Add the onions and celery to the oil remaining in the pan and cook another few minutes or until softened. Add the taro root and cook a few minutes, stirring, then add the tomato sauce, water, lemon juice, pork cubes and some salt. Bring to a boil, reduce heat, and cook, covered, 60 – 75 minutes or until taro root is soft. Taste and add more salt and pepper if needed. Serve sprinkled with parsley.